Heat olive oil in a large skillet over medium-high heat. Add potatoes. 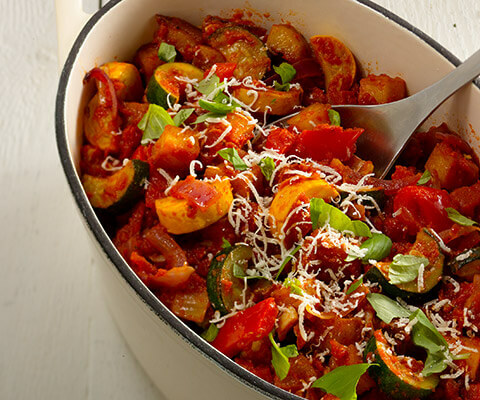 Cook for 10 minutes, then add onions, pepper and zucchini and cook until soft, stirring frequently. Add Classico® Riserva Eggplant and Artichoke Sauce, oregano and crushed red pepper to the skillet. Bring to a boil the reduce heat, cover and simmer for 20 minutes stirring occasionally. Just before serving, stir in chopped basil and season with salt and pepper to taste.